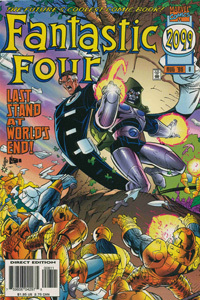 Doom sits and observes the approach of an alien entity as it comes closer to earth. He recognizes the alien planetoid and wonders if the alien's liaison has been withholding information from him. 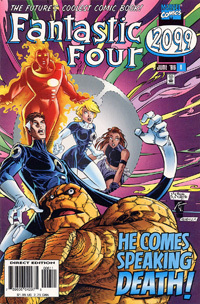 A preview of this issue appearing in Marvel Vision #4 shows that the story and cover to Fantastic Four 2099 #6 were changed prior to publication. While no exact story details are given, it seems that originally instead of meeting Doctor Strange and fighting Mindless ones coming out of the gate in Fantastic Four 2099 #5, the team would have fought The Tzzar of the Negative Zone (mentioned by Chimera in FF2099 #4). Presumably the change in story arose from editor Joey Cavalieri being fired, the creative walk-out, and subsequent change in direction to prepping for 2099 World of Tomorrow instead of 2101 / Fast Forward. Mr. Fantastic convinces Doom to become allies, for the time being. 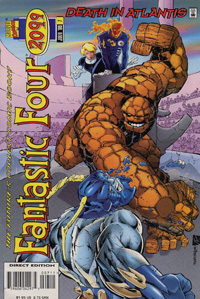 Meanwhile, Sue, Johnny, and Ben are brought before Attuma who proceeds to use them as bait to lure Reed into a trap. In the former Greenwich Village, Doctor Strange battles the woman known only as Strange in order to convince her of her role in protecting the planet Earth from destruction. Back on board Reed's pogo ship, Reed discovers that the planetoid's surface is Techno-Organic. Doom is secretly not surprised because he already knows that this is an invasion. Reed's scans are then interrupted by Attuma who shows that he holds the rest of Reed's family. The Atlanteans also show that they are currently attacking a defenseless Latveria. Unable to withstand the thought of allowing a foreign force attack his home, Doom abandons ship despite Reed's pleas to the stay and help him with the global threat. Doom refers to Latveria as the "Fatherland" for the first time. In Cyberspace Duke Stratosphere runs from an all consuming program devouring Cyberspace itself. In Latveria, Doom finishes off the last of the Atlantean invaders single handily. Informing Attuma of his defeat he returns to his castle where he receives a summons from Fortune. Fortune tells him that their futures are intertwined and that they have stumbled across something. Doom is shocked to find Wire, now a techno-organic being sent by the aliens who orbit the earth. They invite Doom to meet with their emissary. Wire takes Doom to the bottom of Castle Doom where the emissary waits. There the emissary tells Doom of their plan to reclaim scouts that were sent to earth years ago. Suddenly their meeting is interrupted when Kaz, wearing Radian's armor, begins to attack the Emissary. It is revealed that when Doom, Fortune, and Kaz communed with the Y'Lestja each of them was given a gift. Fortune's prescient abilities were expanded, Kaz was given purpose and light, and Doom, well he was given.... Meeting with the emissary, Doom is told that aliens previously invaded Earth but were defeated. They left scouts because they believe humanity holds the key to their next evolutionary step. The scouts were partially assimilated with certain humans creating a cross breed. The emissary wants Doom's help to locate these scouts because their human DNA is cloaking them. Faced with the prospect of Latveria and the rest of the planet being destroyed, Doom does the unthinkable, he makes a deal with aliens. Vince Russell (Inker) - "I inked a couple of issue of Doom 2099 a while back over a penciller named Jeff Lafferty. His pencils were far from traditional and a lot of work but I really got to flex my inking muscles. In my personal opinion, I think that this page represents the best inking I have ever done." 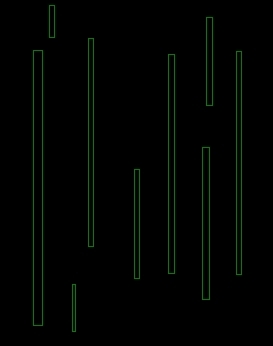 - deviantART.com . Click here to view the full sized image. Doom rescues Reed and the refugee fleet he is piloting from the attacks of Attuma and his Atlantean army. As the battle rages, the two men meet. Doom warns Reed that he should not take the refugees to the Savage Land. However Reed has no choice as it is the only place that his not being flooded. Doom leaves him and cryptically advises patience. Goof: Doom refers to Attuma's "holographic ruse" and "empty threats". 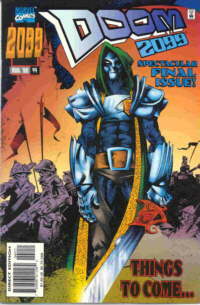 However Doom 2099 #44 depicts a real invasion by Atlantean forces.